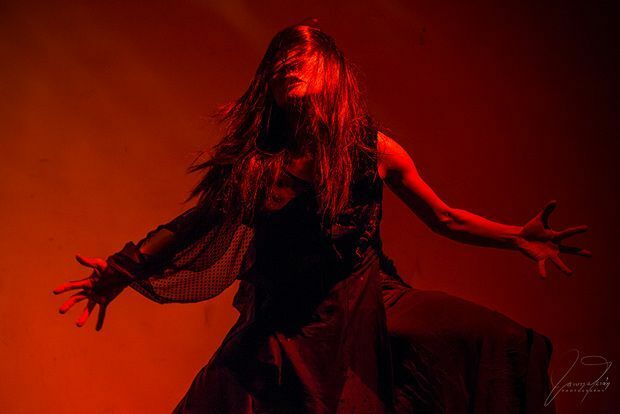 Euripides' brutal play – which is variously seen as a proto-feminist polemic or an ugly blast of misogyny – and the contemporary experimental theatre of butoh are a logical combination. Butoh is a powerful medium for the expression of anguish, and Medea is an anguished, savage creation. Yokko's version of Medea is determinedly one note: less the cunning witch than the violent avenger. As her facepaint cracks and her clothes are torn away, she becomes a nightmarish, animalistic fury. Each episode is accompanied by choreography that contorts the body into frightening shapes, expressing the pain of the woman scorned and her murderous intentions. The butoh is wonderful, shocking, expressive and paints an interpretation of Medea that captures her ferocious longing. The interludes – such as as the recorded messenger speech, or Medea's own monologues (based on Euripides' script) – are less convincing, either underplayed, as in the messenger's speech, or overplayed: this Medea loves to shout. These serve as pauses before Yokko dives back into the physical, returning to terrifying and enthralling contortions. Yokko conjures a series of iconic moments and her Medea is a commentary on how love can be turned into incoherent yet deadly rage. The choreography is daring and sketches out a distinctive, imaginative portrayal of a classical Greek character who is familiar: Yokko reclaims her otherness.